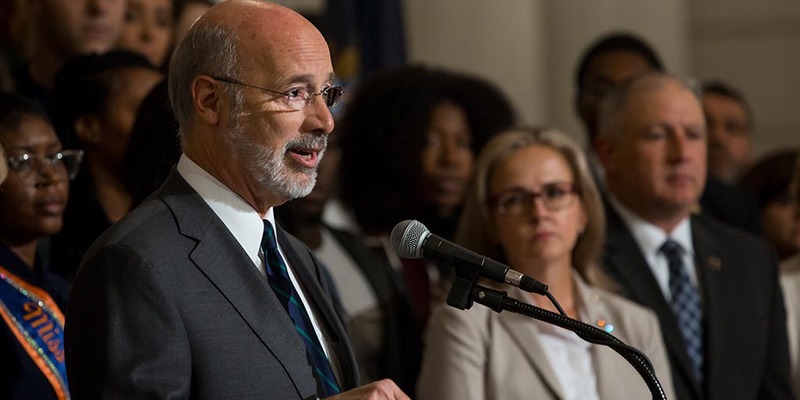 Harrisburg, PA – Today, Governor Tom Wolf stood with lawmakers and local officials in Erie to urge the legislature to come back to Harrisburg to complete the budget process by passing a severance tax and funding the state-related universities. Last week, after the repeated failure of the legislature to finalize the budget deal, the governor announced that he will take steps to manage the state finances and ensure that payments can be made to schools, health and human services providers, and other governmental entities. The legislature has also not taken action to fund institutions of higher education including Penn State, the University of Pittsburgh, Temple and Lincoln universities and the PennVet School. Earlier this week, in an effort to protect school districts and other entities that rely on funding from state government, the governor announced his plan to monetize the Pennsylvania Farm Show Complex & Expo Center through a lease-leaseback arrangement.